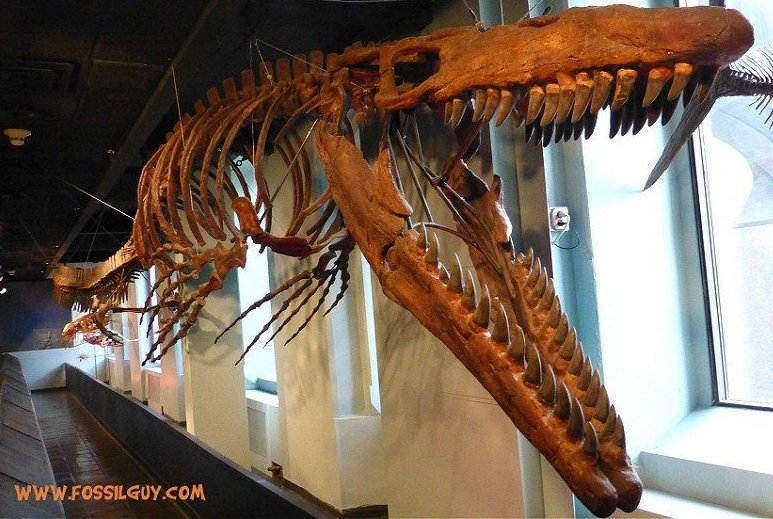 Mosasaur skeleton: Tylosaurus proriger from the Western Interior Seasway of North America. Displayed in the Carnegie Museum of Natural History. Complete skeleton of a 15 foot Mosasaur: Clidastes propython. Clidastes would have looked very similar to a snake in life. Name: Mosasaur (pronunciation: "moh-suh-sawr") - it means "Lizard of the Meuse River"
'Mosa' stands for the Meuse river in Holland - the location where mosasaurs were first described. 'Saur' (Sauros) is greek for lizard. Mosasaurs ARE NOT DINOSAURS. They are reptiles and are closely related to snakes and monitor lizards. Mosasaurs went extinct at the end of the Cretaceous during the end Cretaceous mass extinction event. The Tylosaurus mosasaur shown on the Jurassic Park movie was the largest mosasaur to exist. In real life it grew up to 50 feet in length. It's hard to figure out the exact size of the mosasaur in the movie, but it's conservatively somewhere around 100 feet, which is at least twice the real life size. Also, the Tylosaurus shown in Jurassic World looks more like an aquatic godzilla. In real life, evidence shows they had a caudal fin (tail) like a shark and very smooth snake-like skin. Remember, the movie is an action packed Hollywood blockbuster, it's not meant to be scientific. The first described mosasaur fossils were found in a limestone quarry on the Meuse River in Holland in 1764. Native Americans in the Midwest U.S. had found mosasaur fossils long before the first described fossils. They drew images of them, thought the fossils had special powers, and may have thought they were the remains of the mythological beings Wakinyan (Thunder beings) and Unktehila (Water monsters). Mosasaurs lived in the seas during the Cretaceous. Fossils are found in Cretaceous rock units on almost every continent from North and South America, to Europe, Asia, and Australia. In Hungary, A freshwater Mosasaur has even been found! Some, such as Dallasaurus were only 3 feet in length. While others, like Tylosaurus, grew up to 50 feet in length. Most mosasaurs were over 10 feet in length. Stomach contents of mosasaurs reveal ammonites, bony fish, sea turtles, plesiosaurs, and even sea birds! It appears they could eat whatever they wanted. Mosasaurs were sleek, streamlined, and fast! They had flipper like paddles for arms and legs and a tail fin. They propelled themselves by mianly moving the large fin on their tail in a side to side motion. Mosasaurs were also covered in smooth scales which were very dark in color. Similar to snakes, Mosasaurs had jaws could expand to help swallow large whole prey. Also, like a snake, mosasaurs had two sets of teeth in their upper jaws. This second set was smaller and set further back in the jaw. These teeth would help hold on to struggling prey as the animal swallowed it whole. Although mosasaurs were aquatic, they were reptiles, which means they had to surface to breathe air, like a sea turtle today. A 2015 study found that Mosasaurs gave live birth in the open ocean. Video clip from Discovery Channel: "Dinosaur Revolution" - Mosasaur Rampage showing a mother Mosasaur making a light meal out of Squalicorax sharks. This is a nice representation of what they may have been like in real life - the tail is incorrect though, it should have a fluke. Mosasaurs are considered the Great Marine Reptiles that ruled the seas during the Cretaceous period. Although they are often referred to as the T-Rex of the seas, they were not dinosaurs, but reptiles that returned to the sea during the Cretaceous Period. Even though they are aquatic, these greats beasts were still reptiles that breathed air. Once mosasaurs returned to the seas in the Cretaceous, around 100 million years ago, they rapidly diversified. Numerous subfamilies, genera, and species quickly appeared on a near-global level, even Antarctica. Some developed teeth for crushing shells, and some even expanded into fresh water environments. In 2012 Laszlo Makadi published a paper on the discovery of a fresh water mosasaur from Hungary that lived in the rivers, similar to the freshwater river dolphins today. Although each genera has slightly different morphological features, they all share similar traits. Mosasaurs are all long and sleek. They have arms and legs that evolved into flippers. Their jaws contain numerous conical teeth. These teeth are not designed for cutting, but instead for grasping. Their jaws are also double hinged, meaning they can greatly expand in order to swallow prey whole, like a snake. Also, like a snake, fossil skin impressions show mosasaurs had a scaly skin. A Flipper from the mosasaur Clidastes propython. Notice it's just a arm, like a dolphin flipper. Mosasaurs are considered the Great Marine Reptiles of the Cretaceous. However, there were many other marine reptiles that lived before the mosasaurs. Other great marine reptiles that predate mosasaurs include: the dolphin like ichthyosaurs, the long-necked plesiosaurs, and the short-necked pliosaurs. Examples of these Great marine Reptiles are shown below. 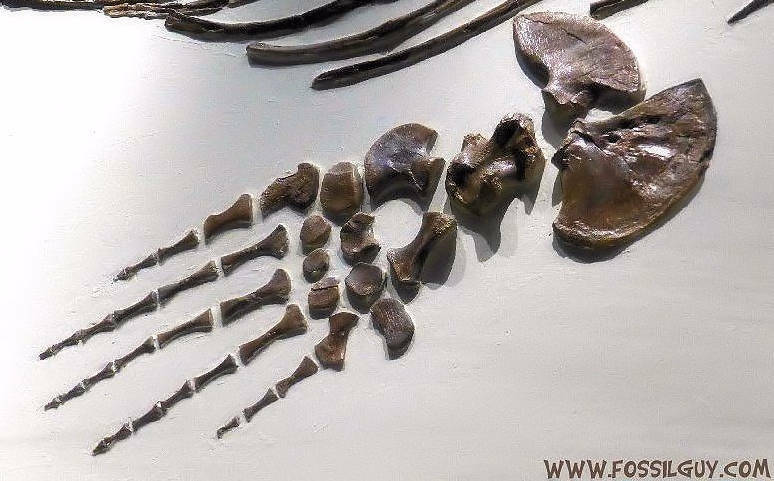 Ichthyosaur Fossil Skeleton from Holzmaden, Germany. Displayed in the Carnegie Museum of Natural History. Notice Ichthyosaurs would look like todays dolphins. 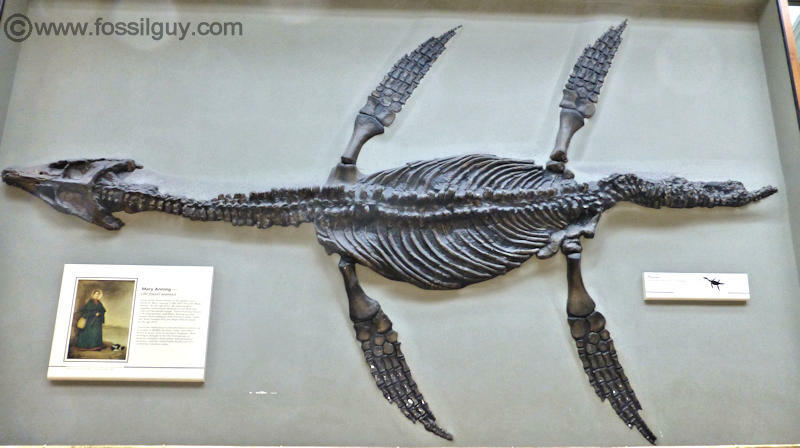 Long Necked Plesiosaur Fossil Skeleton from North America. Displayed in the Academy of Natural Sciences of Philadelphia. Pliosaur Fossil Skeleton: Rhomaleosaurus cramptoni. Cast displayed in the British Musuem of Natural History, UK. Mary Anning's photo is next to it, I think, because she discovered similar plesiosaur and pliosaur fossils on the Dorset coast. Mosasaurs, like snakes had two rows of teeth in their upper jaw, the main set, and a smaller set toward the rear and center of their mouths. These extra teeth called pterygoid teeth are thought to help hold and swallow lager prey whole. Also, like snakes, their jaws could expand, again to help them swallow whole prey. 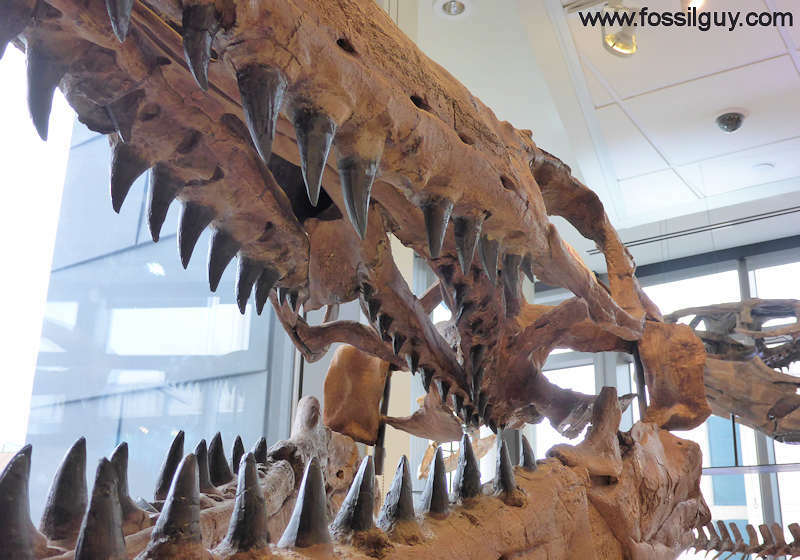 The second row of teeth can be seen in the image below of a mosasaur from the Mace Brown Museum in Charleston, SC. A view of the second set of teeth in the upper jaw of a Tylosaurus mosasaur skull cast. From the Mace Brown Museum in Charleston, SC. 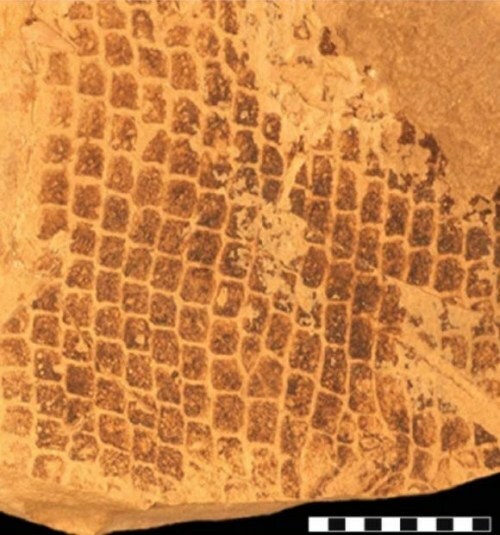 Fossil scales of the mosasaur specimen: SMU 76532 where the melanosomes were found. They indicate the mosasaur had a dark coloration, like a whale. Image by Johan Lindgren (article reference at bottom of page). New research shows they were most likely a dark color, similar to a Sperm Whale coloration. In the past, the color of prehistoric animals was strictly confined to the realm of artists. Over the past few years, paleontologists have been able to study melanosomes in fossil feathers in dinosaurs and birds to determine their colors and color patterns. Now, paleontologists have found fossilized melanosomes in skin impressions from an ichthyosaurs , ancient turtle, and a mosasaur. The research done by Johan Lindgren, et al (2014), shows these prehistoric aquatic reptiles were "at least partially dark colored in life." "The mosasaur contained so much of this pigment, it would have been very dark in color." Lindgren says this dark color scheme, similar to a sperm whale, would help with thermoregulation, protect against UV radiation when at the surface, and provide camouflage when deep diving. How did a Mosasaur Swim? Until recently, the swimming style of a mosasaur could only be determined by the skeletal anatomy. Fortunately, in 2011, Johan Lindgren, et al. studied a well preserved fossil mosasaur (Ectenosaurus clidastoides: Specimen: FHSM VP-401). This specimen has three-dimensionally preserved muscle fiber bundles. By studying this exceptionally well preserved specimen, Lindgren suggests the mosasaur held the front of its body rigid and used the rear of its body and tail for propulsion. This makes for a very efficient swimming machine. This is also similar to how crocodiles swim.
. Also, one specimen (LACM 128319) had a partial body outline preserved. Based on the outline, the mosasaur had a tail fluke like that of a shark. Other mosasaurs have also been found with this fluke like tail. This means they were probably very fast swimmers. During the Cretaceous time period, North America was split in half by a long shallow sea called the Western Interior Seaway. The sea was roughly 300 miles wide and ran from Texas northward through the central United States into Alberta and out the Northwest Territories. The Western Interior Seaway was the habitat of numerous types of mosasaurs. Part of this seaway is preserved throughout Texas, Kansas, and into the Dakotas as the Smoky Hill Chalk and the Pierre Shale. These formations contain a diverse fauna, including large vertebrates, such as the Great Marine Reptiles, the Pterosaurs (Flying Reptiles), Giant Sea Turtles, Giant Fish, and Sharks. There are numerous mosasaurs found in the Western Interior Seaway. However, the three most common mosasaur genera found are Tylosaurus, Platecarpus, and Clidastes. Reconstructions from Williston's 1898 publication are shown to the right. The anterior vertebra of Platecarpus is actually bent downward, as it had a large tail fluke. This video, while a little old, gives an overview of a mosasaur excavations and preparing the fossils for display. Platecarpus mosasaur skull, By Daderot (Daderot) [CC0] from the Senckenberg Museum of Frankfurt. Platecarpus tympaniticus, LACM 128319: upper Santonian-lowermost Campanian, Kansas, USA. Specimen photographed under normal light. Scale bar equals 0.5 m."
Image under CCBY2.5 license. From: Lindgren J, Caldwell MW, Konishi T, Chiappe LM (2010) Convergent Evolution in Aquatic Tetrapods: Insights from an Exceptional Fossil Mosasaur. PLoS ONE 5(8): e11998. doi:10.1371/journal.pone.0011998.g001. 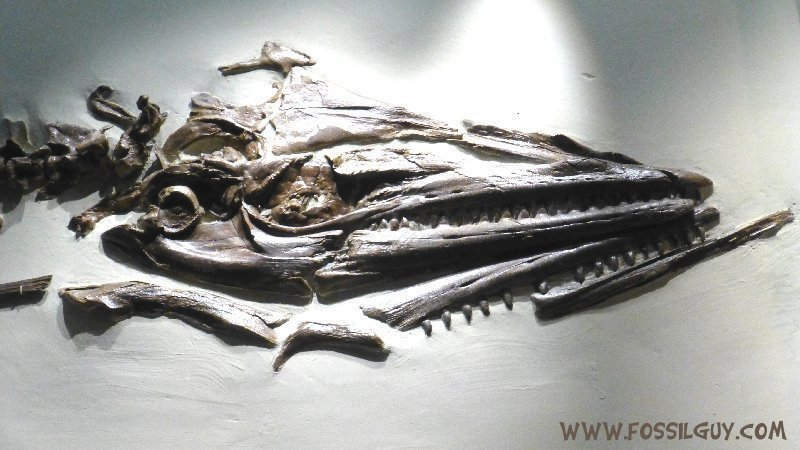 Tylosaurus proriger mosasaur skull from the Carnegie Museum of Natural History. Tylosaurus is probably one of the most well known mosasaurs, due to the fact it's a common centerpiece in many museums, and it's been featured in the Jurassic Park games, comics, and the new movie "Jurassic World". Reaching lengths of over 14 meters (45 feet), it was also one of the larger mosasaurs. Tylosaurus was an apex predator in the Western Interior Seaway of North America during the Cretaceous. This beast could eat just about anything. Smaller mosasaurs and Plesiosaus have been found in the stomach contents of these great marine predators. A giant Tylosaurus proriger mosasaur on display at the Academy of Natural Sciences of Philadelphia. Clidastes propython mosasaur skull from the Carnegie Museum of Natural History. Clidastes was a one of the smaller types of mosasaurs. Although some species were larger, the average length of this genera is only a few meters, perhaps 10 feet in length. This mosasaur was also slimmer than the others, the rib cage was narrower, giving it a more sleek, or eel like look. It was probably very agile, and able to chase down smaller prey. A Clidastes mosasaur skeleton on display at the Academy of Natural Sciences of Philadelphia. A mosasaur tooth as found in a stream bank in New Jersey. In this image, striations and a cutting edge is visible, which is characteristic of a mosasaur tooth. Besides for the Western Interior Seaway, mosasaurs are also found in Cretaceous outcroppings along the East and West coast of the United States. Although Native Americans had found mosasaur fossils in the mid west, the first documented mosasaur fossils from North America come from New Jersey. One popular fossil hunting location is the Big Brook area in central New Jersey. Here, brooks cut through cretaceous sediments, occasionally washing out a mosasaur fossil (usually a tooth or sometimes a vertebra). According to Gallagher, 2005 there are at least 8 genera and numerous species of mosasaur found in the Cretaceous of New Jersey. The common genera of mosasaur appears to be Mosasaurus sp. 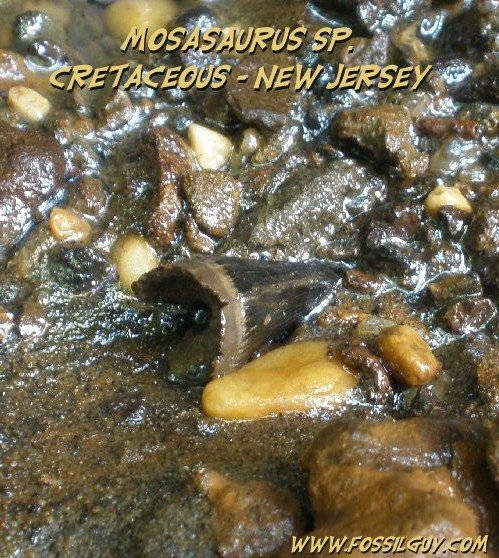 Since mainly only mosasaur teeth are found, and they change shape and size depending on tooth position, no attempt is made here to further identify mosasaur teeth from New Jersey. To try your hand at finding a mosasaurus tooth, go to the Big Brook Fossils Section for more detailed information, including directions. 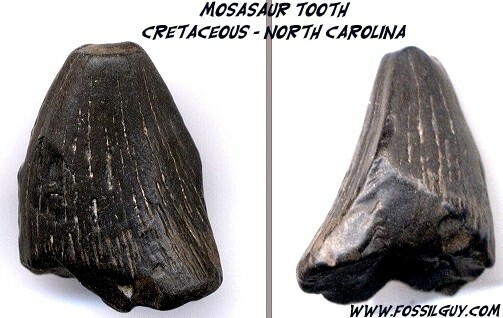 This image shows a mosasaur tooth found in a stream bank in North Carolina. Although this tooth is very worn, it still has visible striations and a cutting edge. These characteristics differentiate mosasaur teeth from similar looking crocodile teeth. 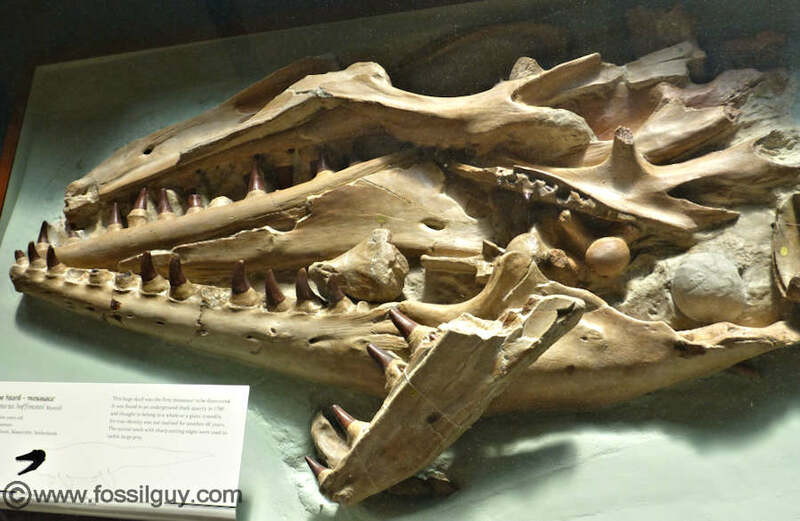 This is a mosasaur skull from Morocco on display at the Natural History Museum in London. The Phosphate Deposits throughout Northern Morocco, including the area of Khouribga, the Ouled Abdoun Basin, and the Ganntour Phosphate Basin are chalk full of Mosasaur fossils. These deposits represent the ancient Tethys sea that covered North Africa and Europe. This sea merged with the early North Atlantic Ocean. Mosasaur teeth are abundant, while jaw and vertebra fragments can sometimes be found. Some beautiful specimens have been excavated, and new genera have been discovered. There are numerous genera of mosasaur found in the deposits, from common Mosasaurus, Prognathodon, and Cladistes, to an unusual mosasaur called Globidens. Globidens looked like a small mosasaur, but has highly unusual teeth. They look like small rounded buttons and were ideal for crushing shells. These fossils are very popular among enthusiasts. With that said, the industry of fake mosasaur fossils has rapidly grown to support the demand. Fossils are very popular among collectors. Ebay is full of them! Because of this, fake fossils are even more popular. fake fossils are often easier and cheaper for locals to create. For example, it is illegal to export fossils from China. So why are there so many Chinese fossils on the market, including 1000's of those little Keichuosaurs and Dinosaur eggs? Some are illegal, but most are fake... Albeit expertly faked! A whole industry in Morocco has been created that centers around the creation of fake fossils. This industry is now perhaps larger than authentic fossil collecting. Fake fossil shops abound throughout the Phosphate regions of Morocco. Anything from Trilobites, Ammonites, to Mosasaurs are all faked. I would strongly caution anyone buying ANY fossil from morocco unless you absolutely know that the dealer is reputable. A popular type of fake mosasaur fossil is individual teeth with the roots and/or jaw sections attached. Some people have bought these and taken them apart to see how they are made. They take ground up matrix and add some glue to form a base. Then they place real mosasaur teeth in the matrix. They add fragments of modern animal bone (usually ground up goat) to make the roots and bone, and add a lighter colored matrix to fill in the gaps. The end result is a nice set of "mosasaur" jaws. 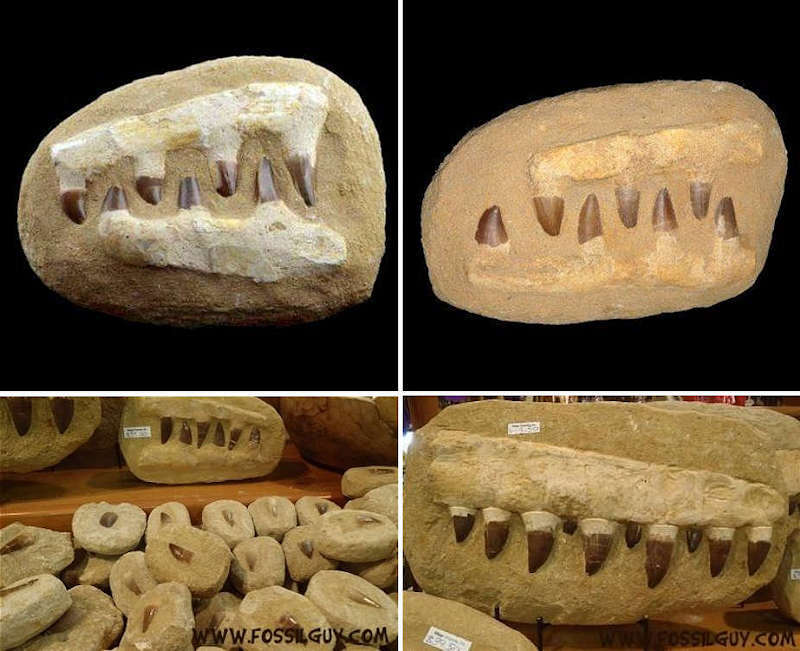 If you ever see mosasaur jaws like the ones below, they are fake. I think they are popular because they make nice display pieces... if you don't mind the jaw section came from a modern goat! Almost all mosasaur teeth with attached roots are also made via this method. Any mosasaur fossil that looks remotely like the ones imaged above are fake composites. Real teeth are often used, but the matrix and bone is made from dust, glue, and the bone fragments of modern animals. The Fossil Era store has a nice selection of real Mosasaur fossils for sale . There are a wide range of sizes and species of mosasaur to choose from. They also have a selection of mosasaur bones and teeth in real jaw sections. Sea Dragons: Predators of the Prehistoric Oceans is an great book that explores the lives of giant seagoing reptiles, including Mosasaurs, Ichthyosaurs, and Plesiosaurs. While Dinosaurs ruled the land, see what ruled the seas! This book is all about life in the Western Interior Seaway during the Cretaceous. It descripes everything from the prehistoric sharks, to mosasaurs, to icthyosaurs on an intermediate reading level. The Author, Michael Everhart, is an Adjunct Curator of Paleontology at the Sernberg Museum of Natural History, and an expert on Late Cretaceous fossils of the Western Interior Seaway. This well researched book also contains many photos, illustrations, and drawings. If you have ever come across his wonderful Oceans of Kansas website, this book is a must! Takuya Konishi, Johan Lindgren, Michael W. Caldwell, and Luis Chiappe. (2012) Platecarpus Tympaniticus (Squamata, Mosasauridae): Osteology of an Exceptionally Preserved Specimen and Its Insights Into the Acquisition of a Streamlined Body Shape in Mosasaurs. Journal of Vertebrate Paleontology 32(6):1313-1327. If you thought Mosasaurs were Giant Sea Monsters, check out this beast that came millions of years later!